The Supreme Court on Thursday ruled that internet retailers can be required to collect sales taxes even in states where they have no physical presence. The decision, in South Dakota v. Wayfair Inc., was a victory for brick-and-mortar businesses that have long complained they are put at a disadvantage by having to charge sales taxes while many online competitors do not. And it was also a victory for states that have said that they are missing out on tens of billions of dollars in annual revenue. Writing for the majority in the 5-to-4 ruling, Justice Anthony M. Kennedy said the Quill decision caused states to lose annual tax revenues of up to $33 billion. Amabezos has already implemented sales tax in advance to the ruling, to a degree, but there are probably other ways that they are gaming the system to their advantage. @robertGL - Items sold by Amazon itself are taxed right now, but third-party sellers are not (even if fulfilled by Prime). This will potentially close that loophole. Yep and it is 50-55% of all sales with around 70-75% of photo/cinema gear. Also it is good to note that Amazon do not pay taxes (instead they usually get exceptions, subsidies and such). 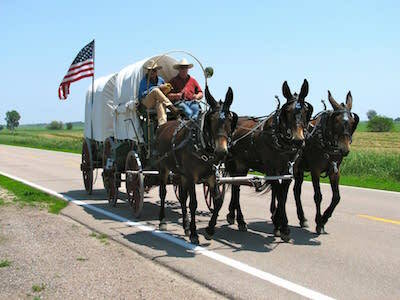 (Blaine WA) The FBI uncovered a network of covered wagons and Pony Express agents carrying cameras and photo accessories from five sale tax free states: Montana, Alaska, Delaware, Oregon and New Hampshire. Buyers would have items shipped to a central P.O. Box in one of these tax free states. Items were then reshipped throughout the U.S. via Pony Express or covered wagons to avoid paying sales taxes. In Alaska, Santa Claus and reindeer sleds were utilized. FBI Agents Mulder and Scully said " We were on a routine investigation of Aliens smuggling shoes into Canada when we saw a covered wagon race by, emblazoned with the slogan " Tax Free or Die!" In response, President Trump signed an executive order banning photography and imposing an 800% tax on corn flakes.